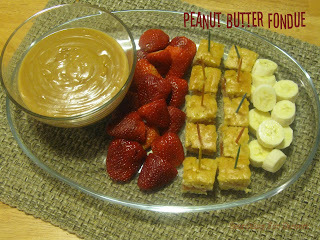 Please forgive the picture taking as it does not portray the peanut butter fondue as well as it should. 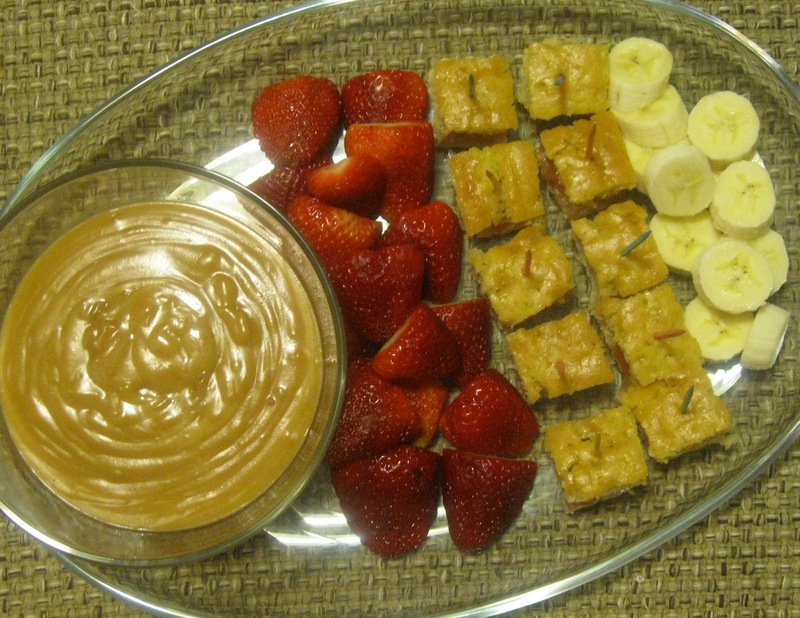 This fondue is smooth and creamy and perfect for dipping. I'm really excited to say this is my first time participating in an Improv group for bloggers. The idea is that we are given two ingredients and we can make whatever we want to with them, then we all post about it on a specified day each month. I thought it sounded like a pretty awesome idea and I was right! :). This month, as I'm sure you guessed, is Peanut Butter and Jelly! The Improv group is hosted by Frugal Antics of a Harried Homemaker and if you're interested in finding out more information about the group you can go here. If you have read my blog for any amount of time you know that I am a big fan of peanut butter so this was right up my alley. I will say I made my own pound cake but I didn't really like the way it turned out so the recipe just says "pound cake" and so you should buy some or use your favorite recipe. When I make some pound cake I really like I may update the recipe to link to the pound cake recipe. I chose strawberries to go with the "jelly" part of the theme as well. The bananas are there for fun but I will say that the bananas we the favorite combo with the peanut butter for everyone who tried it. 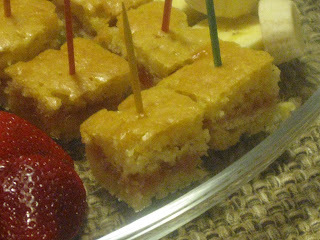 The pound cake was nice with the jelly in the middle but it was delicate and so you had to dip carefully or use a spoon :). I'm pretty sure most people love fondue and dipping things in it so this would be a quick and fun treat for dessert. 1. In a saucepan over medium-high heat stir the half and half, honey, and brown sugar and bring to a boil. Stir in peanut butter until smooth. Serve warm. 2. Cut pound cake into thin slices. Spread jelly on half of the slices then top with the other slices to make bite-size sandwiches. Stick toothpicks into “sandwiches” for serving. Slice strawberries and bananas. What an original idea! Looks delicious! Love this - a clever take on the PB&J theme! Thanks :) Your PB & J bread is a great idea also. I wouldn't have thought to bake it like you did but it looks really good. Thanks :) I'm glad you could stop by! Meatless Monday! Caramelized Brussels Sprouts!